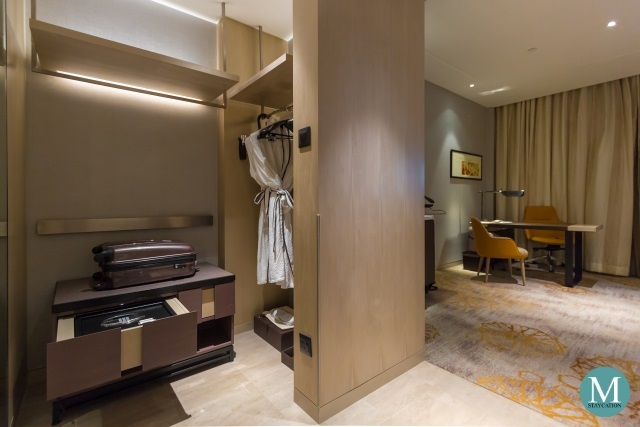 Entering the Junior Suite, guests will be welcomed by the spacious foyer where the open closet is located. There's luggage rack which also houses the in-room safe. There are ample space to hang clothes for a week-long stay. Wooden coat hangers and silk padded hangers are also provided. 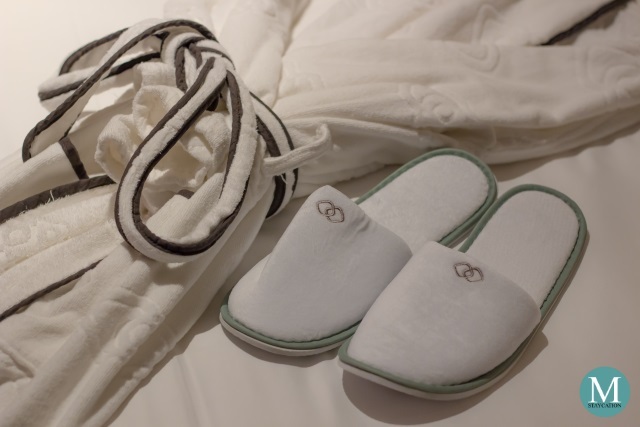 Two sets of bath robes and room slippers are also placed at the closet. I particularly loved the quality of the slippers as the sole was thick and the lining was well padded. The bath robes were thick and made of 100% cotton. Opposite the closet is the en-suite bathroom. It was spacious and generously lined with marbles. 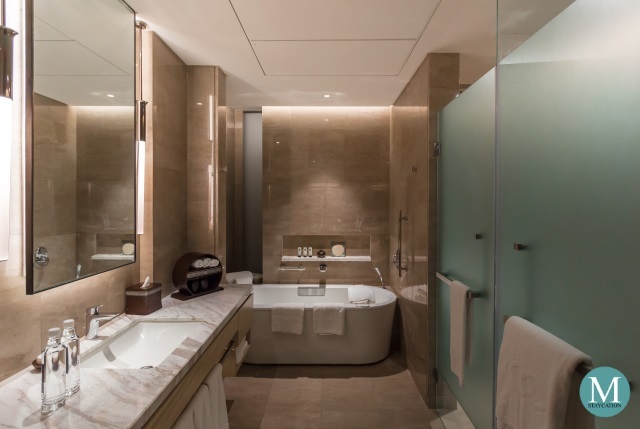 The bathroom has a separate bathtub and a walk-in shower. The water closet is also very spacious. The toilet is fitted with a bidet seat cover. The walk-in shower has a hand-held and a rainfall shower-head installed. Water pressure was generally strong during my stay. I was overwhelmed by the number of towels provided inside the bathroom. The bath towels were huge which will definitely please the hotel's western guests. 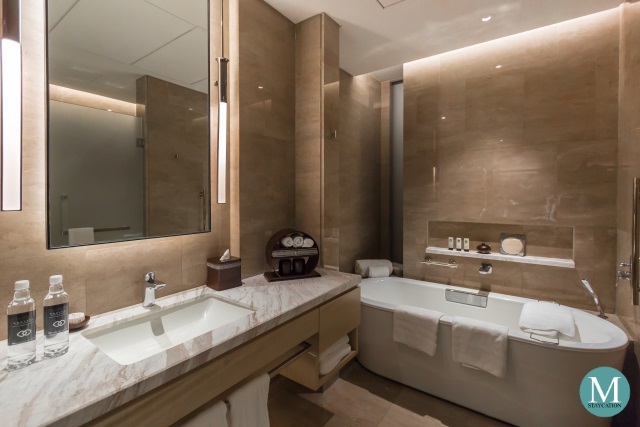 The bathroom only had a single basin which leaves the marble counter-top with plenty of space for your personal toiletries. In addition to the vanity kit, two bottles of water are also provided daily. 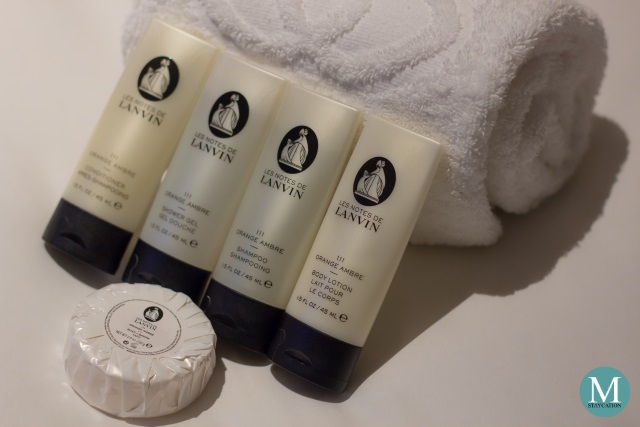 Guests staying at Sofitel Kuala Lumpur Damansara are provided with Les Notes de Lanvin III Orange Ambre body and bath amenities which include a hand soap, shampoo, conditioner, shower gel and body lotion. This collection features the Orange Ambre fragrance designed by the French high fashion house Lanvin. The foyer leads to the main bedroom of the Junior Suite. 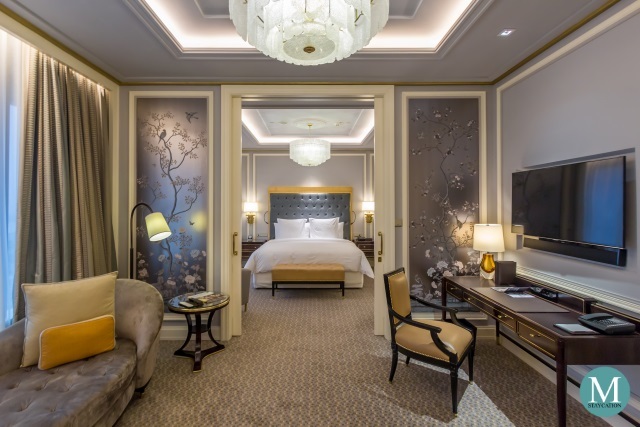 Located at the corner of the hotel tower, the Junior Suite enjoys plenty of natural light. 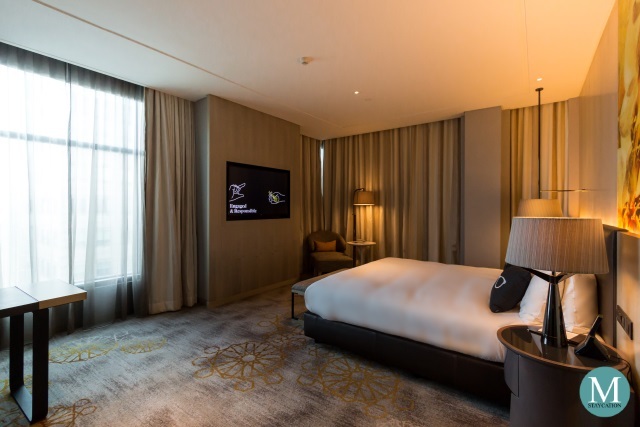 Sheer and blackout curtains will allow the guests to adjust the brightness inside the room and would also allow guests to maintain privacy inside the accommodation. 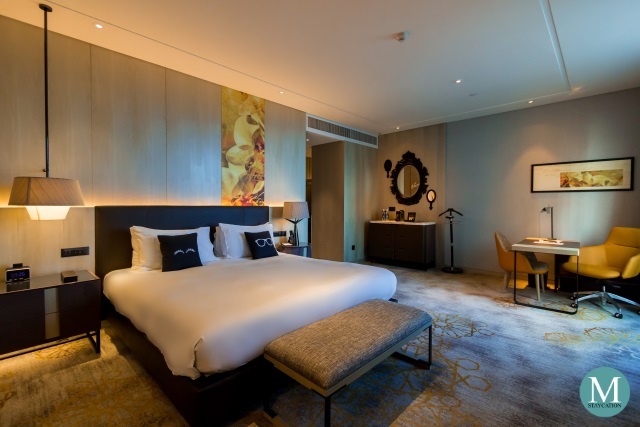 The Junior Suite is furnished with a king size signature Sofitel Mybed, an end-of-bed bench, two bedside tables, a sofa chair and a coffee table. 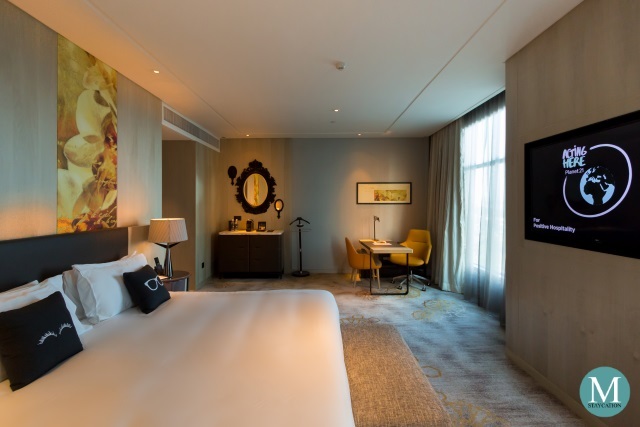 A 49" LCD TV is mounted in front of the bed and had both local and international cable channels. Controls to the lights are conveniently place next to the bedside table. 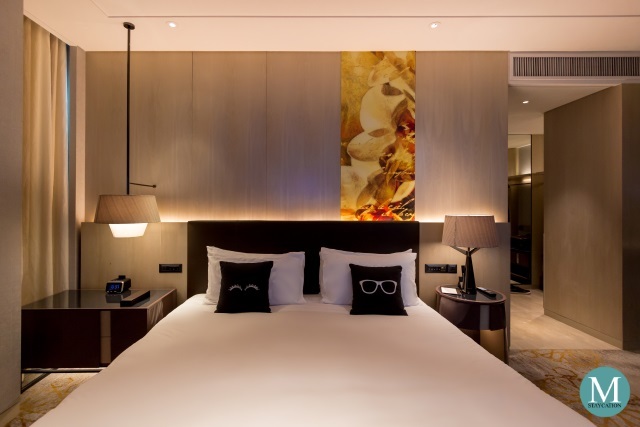 There are also power outlets next to the control panel so guests can charge their mobile phones right next to the bed. 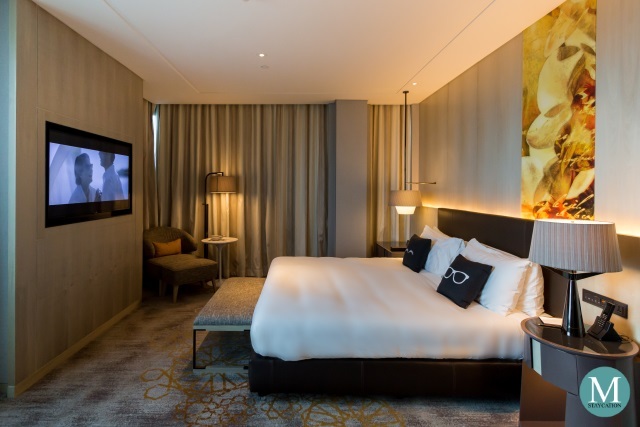 The Junior Suite is also equipped with a wireless phone with the base placed on the bedside table. On the other end of the room is a minibar cabinet which stores a mini refrigerator fully-stocked with canned juices and soda, as well as premium bottled water, beer and spirits. On top of the cabinet is a Nespresso machine which guests can use to make freshly brewed coffee and espresso. 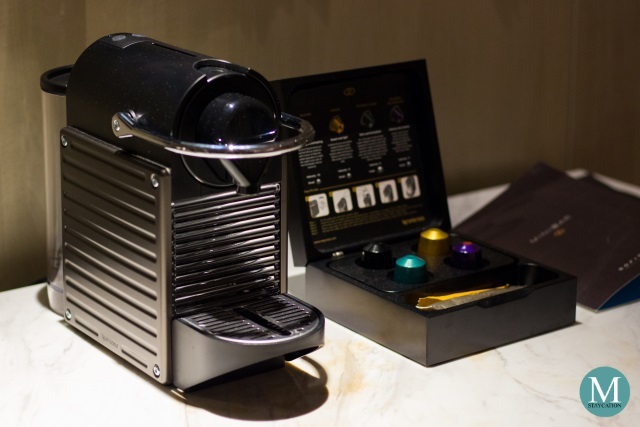 Four complimentary Nespresso coffee capsules are provided daily. 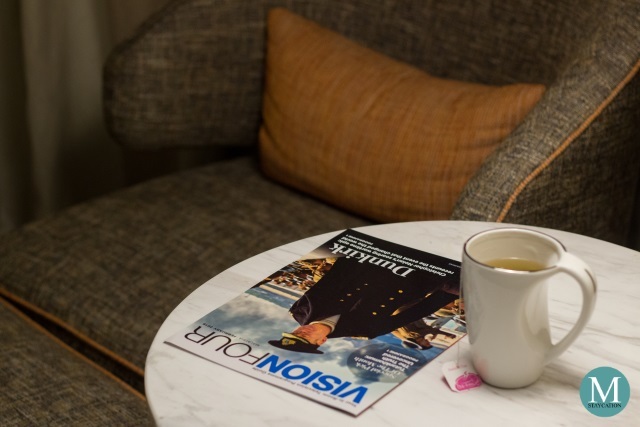 Guests are also provided with complimentary Ronnefeldt tea bags daily. An electronic kettle is located inside the minibar cabinet. All other items inside the minibar are chargeable to the guest's account. A complete price list of minibar items are placed on top of the minibar cabinet. 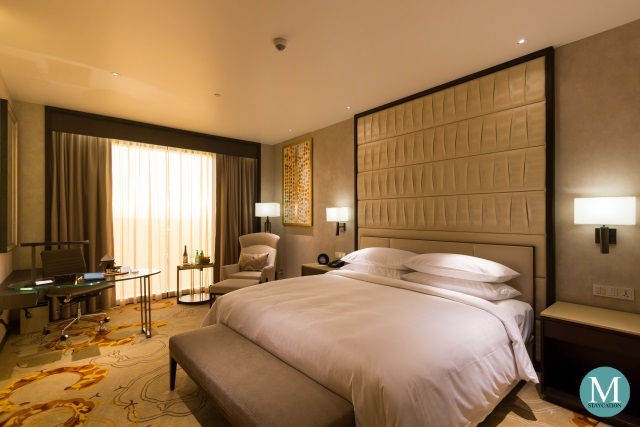 Business travelers staying in a Junior Suite will also love the executive writing desk. In addition to WiFi, there are also LAN ports as well as numerous power outlets located next to the table. The table is positioned so that the TV is not in the line of sight allowing you to focus on work. 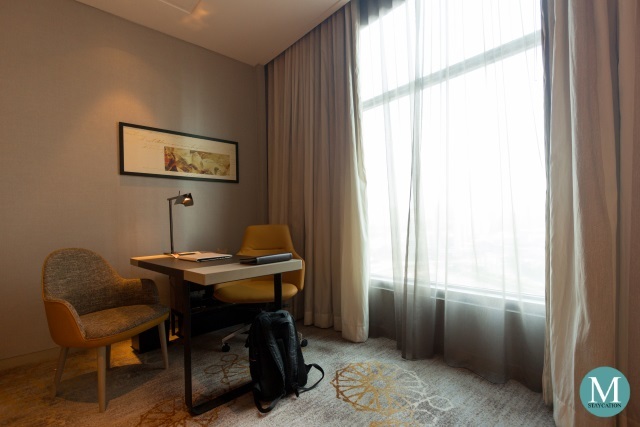 This table served as my work station during my visit to Kuala Lumpur, allowing me to easily catch-up on writing travel and hotel articles. 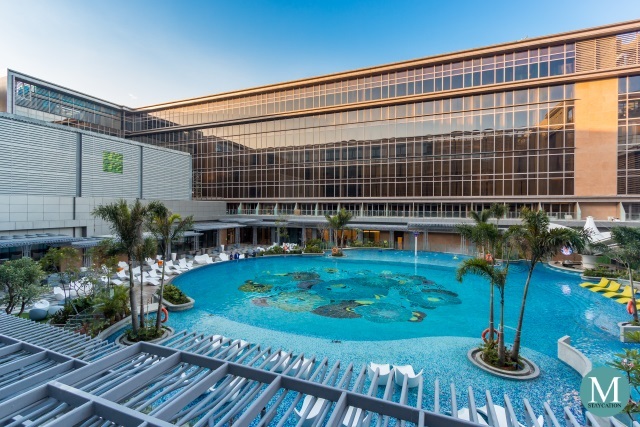 I really had a relaxing three-nights stay here at the Junior Suite of Sofitel Kuala Lumpur Damansara. I particularly loved the bed. It was one of the most comfortable beds I ever experienced. Waking up on my last day in Kuala Lumpur, I was feeling recharged and ready for work later that day.